YCS Atlanta 2018 Event Table of Contents! Did you miss any of the action from the 2018 Yu-Gi-Oh! Championship Series in Atlanta, GA? Don’t worry – you can revisit the action using this handy Table of Contents! YCS Atlanta: Round 1 Pairings! YCS Atlanta: Round 2 Pairings! YCS Atlanta: Round 3 Pairings! YCS Atlanta: Round 4 Pairings! YCS Atlanta: Round 5 Pairings! YCS Atlanta: Round 6 Pairings! YCS Atlanta: Round 7 Pairings! YCS Atlanta: Round 8 Pairings! YCS Atlanta: Round 9 Pairings! YCS Atlanta: Round 10 Pairings! YCS Atlanta: Round 11 Pairings! The Finals of YCS Atlanta 2018 Are Underway! 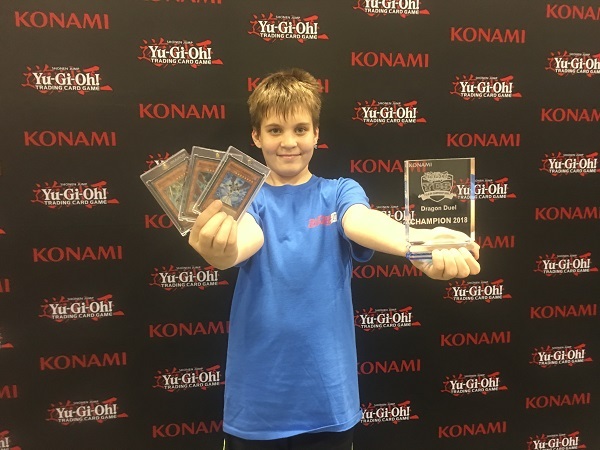 Saturday’s Top 4 Dragon Duelists at YCS Atlanta! Sunday’s Top 4 Dragon Duelists at YCS Atlanta! QQ: What’s the Deck to Beat? QQ: What’s Your Favorite Change On The New F&L List? QQ: What’s Your Favorite Legacy Support Link Monster? QQ: Who’s Your Favorite Yu-Gi-Oh! Villain? YCS Atlanta: ATTACK OF THE GIANT CARDS!! New Regional Qualifier Game Mat Featuring Saryuja Skull Dread! Check Out This Pot of Greed! ATTACK OF THE GIANT CARD!! Winner #1! Check Out These TWO New Judge Mats! Public Events Points Playoff Winner! YCS Atlanta Top 4 Duelists! 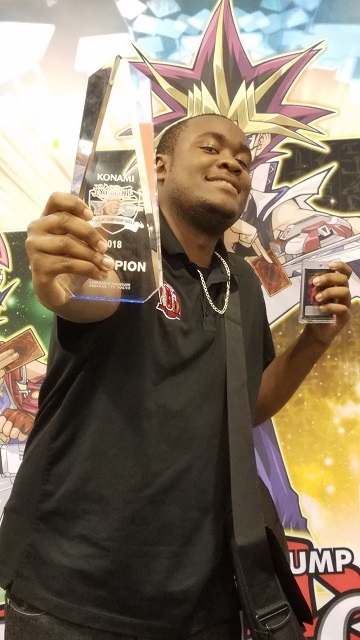 YCS Atlanta is finished, and we have a winner! The Top 4 Duelists of YCS Atlanta have been decided! It all comes down to this! It’s a Pendulum mirror-Match in the Finals of YCS Atlanta with Dablessin Wilson from Waukegan, Illinois taking on Jeremy Mitchell from Jacksonville, Florida. Only one of these Duelists will walk away with an Ultra Rare Number 89: Diablosis the Mind Hacker and the title of YCS Champion! For the last time this weekend, it’s time to Duel! We have our winner for the Public Events Points Playoff! We’re down to just four Duelists! There are lots of similarities between these two Duelists – they’re both from Florida, both are playing Pendulum Magicians, and both have come just shy of glory, having each taken second place at UDS Invitationals in recent times. Only one can move on from here to get another chance at a big win! We have our first Public Events Playoff Winner! The Top 4 is underway! Check out who’s Dueling in the Top 4 of YCS Atlanta!